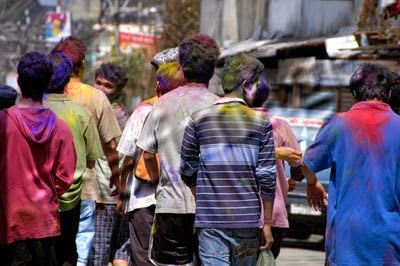 Holi tomorrow will be a dry day in Darjeeling, not just for liquor restrictions, but also because of water scarcity. Most homes in the hills have been getting municipal water supply once a week. Coupled with that is a daytime temperature of around 13°C and a nip in the air. Getting wet in the cold, then wasting precious water to wash all that colour does not seem like a good idea to many hill residents. "We will be celebrating Holi, but it will not be like in the plains. The cold weather and the water scarcity are spoilers. We cannot afford to waste water in celebrating Holi and then washing our clothes. Moreover, getting wet in this cold weather throughout the day is not exactly a nice experience," Rajesh Rajak, general manager of Hotel Anand Palace, said. Darjeeling municipality chairman Amar Singh Rai said: "At the moment we are distributing water once a week." For more than a decade now, water scarcity in the dry season has plagued the hills as its two main reservoirs are rain water-fed. The Balasun water project, billed to be the solution to Darjeeling's water woes, is yet to take off. The North Lake and South Lake at Senchal, which supplies water to Darjeeling have storage capacities of 20 million gallons and 13 million gallons, respectively. The two lakes are partly filled by 26 streams. Darjeeling needs 15-18 lakh gallons of water daily. During dry periods, as now, the Darjeeling municipality can supply about 7-8 lakh gallons of water. There is a third lake, Sindap, which has a capacity to store 8 million gallons of water, but the lake is undergoing repairs for a leak. "Water can be stored in this lake only till the halfway mark because of the leak. The GTA, however, is repairing the lake," Rai said. A lacklustre Holi has also meant little business for traders selling colours. Dabloo Gupta, a businessman who has stocked aabir in his shop, said: "Business is really slow. In any part of the country, those involved in the business will be running out of stock by this afternoon. But I have hardly sold any of the colours." A sizeable part of the growing number of Hindi-speaking businessmen in the hills have families and friends in Siliguri. Businessmen like Bimal Jhawar left for Siliguri today to celebrate Holi there. "Holi has lost its charm in the hills over the past decade because of the water scarcity," Jhawar said. "The local population's participation is also on the wane. Most of the business community members now have establishments in the plains and almost 60 per cent of them will be celebrating Holi in Siliguri," he said. Earlier, hill residents would organise a march with drums on the day of Holi called Dhap Yatra. "When we were small, there used to be a Dhap Yatra in Darjeeling but for the past few days there has been no such yatra. Earlier, the locals used to participate in huge numbers in the yatra," Jhawar said. The Balasun project, when complete, will pump water 16 hours a day through two pumping stations. It has been estimated that the lakes will receive about 2 million gallons of water daily from the Balasun river. Holi tomorrow will be a dry day in Darjeeling, not just for liquor restrictions, but also because of water scarcity. "We will be celebrating Holi, but it will not be like in the plains. The cold weather and the water scarcity are spoilers.